You must sign in before taking the self-guided tour (i.e. exploring The Center). No dogs without a leash. If your dog relieves itself, please pick it up and take with you. No person under the age of 13 allowed without an adult. Do not take or remove rocks from piles or walls. 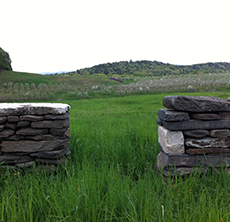 Do not climb on rock piles or walls. Do not take anything from the barn. All literature must stay in The Center. Turn off lights and close doors when leaving. Valuable Lost and found items will be stored until your next visit. Incidental items are not kept for an extended period of time. No non-working, non-enrolled person on the worksite. Visitors may be greeted outside or away from the worksite. Wear heavy hiking shoes or boots. Use protective eyewear while building or rebuilding walls. More than 14 days prior: 100% refund. 4-14 days prior: 50% refund. 0-3 days prior: no refund. Workshop fee must be used for the date reserved. Fees may not be ‘saved’ and transferred to another date. Workshop fee is transferrable to another person, for the date reserved. The Certification Plan application Form and payment must arrive no less than SIX WEEKS prior to the test date. Please remember to sign the form. 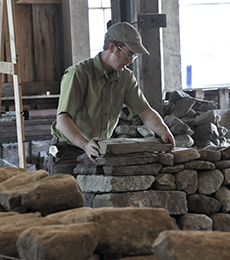 Checks should be made payable to The Stone Trust. At all levels, all work must be the unaided work of the candidate. Candidates should ensure their attire and conduct throughout the test are in the best interests of their safety and the safety of others on the site. All involved with tests should behave in an appropriate manner throughout. Candidates should not take a test on a section of wall that they have previously worked on. Once the test is completed, the score is determined to pass or fail. After which the candidate and examiners sign the mark sheet for submittal to the DSWA. If desired the examiners will discuss and review the mark sheets and test wall with the candidate after all tests are completed. The DSWA will issue certificates to successful candidates, usually within four weeks of the test. Where a candidate fails to achieve the marks required to pass a test, examiners must clearly indicate areas of weakness to the candidate, if requested by the examinee. At all levels, a period of three months is advised before a candidate applies for a re-test. It is the candidate’s responsibility to ensure Certification Examination requirements are understood. 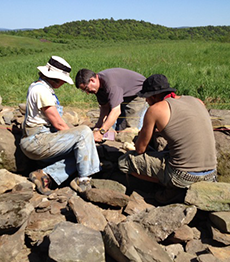 Candidates who wish to have their dry walling skills examined for certification should read and fully familiarize themselves with the certification information on The Stone Trust’s website. The Stone Trust highly recommends that all Level I and II candidates take a Pre-Test. Test Days require a minimum enrollment. If the minimum enrollment is not met a full refund of test fees, will be issued. If a certificate is lost or damaged, replacements can be obtained from DSWA, at a cost determined by the DSWA (currently about $50). Appeals: Any appeal made against a test result must be submitted in writing to the Stone Trust within two weeks of the test date. Full details must be given and any appeal must be accompanied by a fee of $250, which would be refunded if the appeal is upheld. Full refund will be paid to all enrolled candidates. More than 30 days prior: 100% refund. 8-30 days prior: 50% refund. 0-7 days prior: no refund. 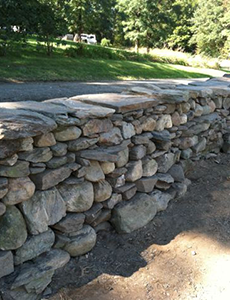 Workshop in progress on roadside wall along Dutton Farm Rd. 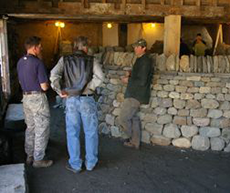 Completed section of dry stone wall built in a workshop.